ASR delivers marketing services and the creative and technical development of technology based products. ASR is constantly monitoring industry trends so that we can properly adjust our strategy to meet customers demands of today, but be prepared for tomorrow. ASR aims to offer simple solutions to complex problems. ASR believes that Customer Service isn’t a department, it’s the entire company’s responsibility. It is ASR’s mission to deliver the best possible local customer service, technical resources and overall market and sales support to our regions Systems Integrators, Distributor Partners and Consultants while constantly building business on behalf of the excellent Manufacturers we represent. ASR Enterprises LTD, originally founded in 1972, was founded to provide the best possible local Manufacturer support to local Audio and Video dealers and integrators. Even back then, ASR was at the forefront of providing more than ‘just a spec sheet and a cup of coffee.’ When Pat Foley purchased the company in early 1995 and renamed it ASR Enterprises Inc., he began to transform the company into a Representative Firm that specialized in not only Commercial Audio Visual Systems, but other Related Markets- such as Physical Security, Intercom, Audio/Visual and other Technical Products. In 1997 Brian Griswold joined ASR as a Partner to help round out ASR’s technical resume and brought focus to the then emerging IP Video market. After spending several years as the Maryland, DC, Virginia Security Territory Manager, Josh Logue was announced as a partner January 2012. Together Foley, Griswold and Logue provide a technical approach that spans 4 decades of product knowledge and industry experience. Today ASR is positioned as a technical leader within the Markets the company serves, but especially as pertains to Advanced IP Products. Representing some of the Finest Physical Security and Audio Visual Lines in the industry is a point of pride within ASR. 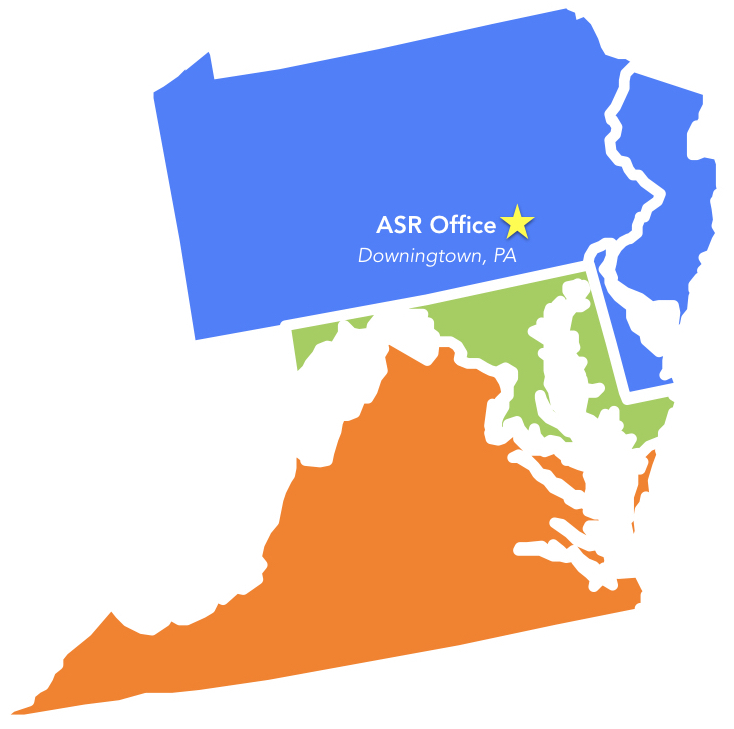 ASR Enterprises provides coverage of the Mid-Atlantic Region (Eastern Pennsylvania, Southern New Jersey, Deleware, Maryland, DC and Virginia). With an inside office staff located in Downingtown, PA and field associates located throughout the territory, we are able to provide local support to the markets we serve.